2003 represented a big year for the quintessentially British Bentley marque, as not only did they risk it all with a new car dubbed the Continental GT, they also asked buyers who have been with Bentley for decades to buy a car that was the opposite of what the marque typically stood for. The Continental GT was like nothing we’ve ever seen before from Bentley, as it was curvy, low and sporty; something Bentley has never really done before. But it worked, and the GT has gone on to redefine how we view Bentley. Flash forward to today, the Bentley Continental GT is set to continue its dominance of the luxury GT car into the next decade. 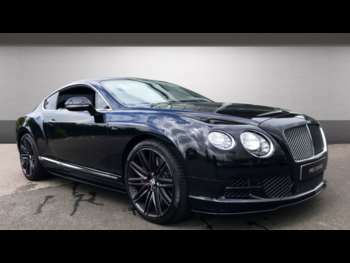 There is an abundance of used Bentley Continental GTs for sale at RAC Cars so that you can find the right spec for you. With a used Bentley Continental GT, you can get a 6.0 litre W12 550bhp engine with loads of torque, four-wheel-drive and high levels of luxury. You pay a lot for one, or a little less for a used Bentley Continental, but you really are getting a whole lot of car for your money. The interior is incredible, the seats are extremely comfortable, and the dashboard works as you would expect. The twin-V6 3.0-litre engines come with two turbos and enough power to get the heavy GT down the road quicker than a lot of purpose-built supercars. It’s everything a Bentley should be. The Continental GT is a heavy car, there’s no getting around that. But with the might of the 550bhp W12 engine behind it, you’ll be stunned by just how quick it can be. Overtaking is ludicrously easy, and the grip is just nothing short of epic thanks to the four-wheel-drive system. The seating position is close to perfect, the seats themselves are stunningly supportive, and there’s even room in the back for two people. The near-200mph top end is impressive, but even with this incredible turn of speed; the GT is still very easy to drive. It’s really a jack-of-all-trades.